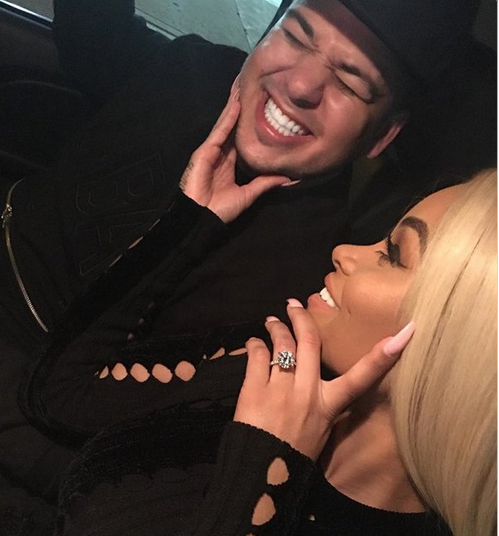 New broke a few days ago that Robert Kardashian and overnight girl friend Blac Chyna were engaged to be married. Blac Chyna herself posted this cryptic message on her social media account, putting in the caption the word “Yes”. The Diamond and the clarity are estimated to put the ring in the estimated range of 350,000-375,000. So Chyna is walking around with a house on her hand. Every one in the Kardashian Camp has been silent, yet that doesn’t stop whispers through out there camp from getting out. Word on the street mama Kris Jenner isn’t a bit happy about said engagement and I can only imagine how Khloe Kardashina is taking it. Her and Rob were the closest out of all his siblings. Its interesting cause now this must put some kind of pressure on Kylie to have to bury the hatchet with Blac Chyna. I wonder what’s to come after the I do’s. Everyone seems to be rooting for Rob and Blac Chyna except his family. Tyga has spoken out publicly releasing a statement to TMZ saying that he’s happy for Rob and Angela (Chyna’s real name) and that he wants to see the mother of his child happy. Also my my main concern is my child..So I though that was sweet of him to say. I like that Tyga isnt acting like Future. He’s setting an example of what a man should do and say when the mother of his child moves on. So kudos to you for having such a positive outlook and attitude, I’m starting to like you more and more Tyga..